This interesting name of Medieval English origin is locational, either from a place so called in North East Somerset, near Weston-Super-Mare, or a dialectal variant of Hebden, from a place in Yorkshire. 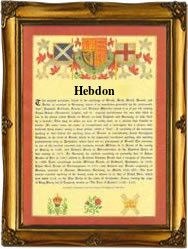 The derivation, of Hebden, which was first recorded in the Domesday Book of 1086 as "Hebedene", is from the Old English "heope", rose-hips, with "denu", a valley, and the variants include Hebdon, Hebden and Hepton. It is thought that the derivation of Edbon or its variant Edben, is either the same as the above, or from an Old English personal name "Ebba", with "denu", thus Ebba's valley. It is interesting to note that the name Ebdon, is prolific, both in Devon, the neighbouring county to Somerset, which suggests that large numbers of name bearers migrated West, and also in Yorkshire. One Gregorye Edbon married Katheren Symons on July 26th 1613, at Ottery, St. Mary's, Devon. The first recorded spelling of the family name is shown to be that of Clement Edbon, which was dated June 4th 1567, in the Colyston, Devon, during the reign of Queen Elizabeth 1, known as "Good Queen Bess", 1558 - 1603. Surnames became necessary when governments introduced personal taxation. In England this was known as Poll Tax. Throughout the centuries, surnames in every country have continued to "develop" often leading to astonishing variants of the original spelling.